Subject: Tells the history of the Boones Ferry across the Willamette River near this site. During the period of Oregon’s Provisional Government (1841-1849), residents traveled by Indian trails, water courses, or on primitive rough-hewn wagon roads etched by emigrant settlers. During the days of the Territorial Government (1849-1859), and long before the State Highway Commission was established in 1917, travel and commercial transportation was often the result of ambitious, enterprising Oregonians such as the Alphonso Boone family of Clackamas County. Alphonso Boone, grandson of frontiersman Daniel Boone, emigrated to Oregon with 10 children in 1846. The family established homesteads on the Willamette River between present-day Oregon City and Buttesville. 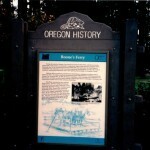 By 1847, the Boones established a ferry crossing on the Willamette near this marker, and eldest son Jesse began clearing a path through Marion, Washington, Clackamas, and Multnomah Counties known today as Boones Ferry Road. Jesse Boone operated the ferry until his death in 1872. The ferry continued in private hands for several years until Clackamas County, and finally, the State of Oregon assumed control in the early 1900s. Boones Ferry crossed the Willamette for 107 years carrying thousands of horses, cows, buggies, automobiles, and pedestrians. By the early 1950s, the cable-drawn ferry carried 12 cars and made up to 300 crossings per day. The ferry was decommissioned in 1954, shortly after completion of the Boone Bridge across the Willamette River.